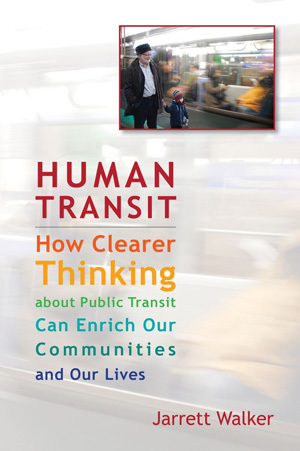 Human Transit is a blog about public transit planning and policy, by a consultant with 20 years experience in the field. For more on the blog, its purpose, and its author, please see the welcome and manifesto. I’d just add that coverage services could be made far more energy efficient, if energy efficiency was funded. A pluggable parallel hybrid with a small high compression constant output diesel engine, batteries and relatively low geared (for among other things better dynamic braking) electric motor, and plugs at layover bays, and it might not run Express routes all that effectively, but for regular and circulator coverage routes, it can be big enough for RORO wheelchair accessibility while providing very good fuel efficiency and having very responsive acceleration out of the stop. But you get what you pay for – expecting transit agencies to spend capital funds on maximizing energy efficiency on that kind of route when it receives a bare trickle of funding as transport for the indigent is insane. I guess that makes me a geek-anarchist in simply taking a route number from wherever there are missing numbers in our system. Louisville Transit didn’t number its routes until the mid-fifties, and then only on schedules and the system route map. East-west routes had odd numbers and north-south routes had even numbers. Hence, we had routes 2 (2nd Street), 4 (4th Street), 6 (6th Street), 12 (12th Street), 18 (Preston & 18th Street) and 22 (22nd Street), but there never was an 8, 10, 14 or 16. There were similar gaps on the east-west grid, so new routes were just plopped down with any number not already established by the old setup. Bus riders in my city seldom refer to the numbers anyway, except for suburbanites who understand that any route with an ‘X’ after the number is an express route. Too often I hear from riders telling me that “the 23rd & Broadway bus (Route 23) be runnin’ late.” It does go to 23rd & Broadway, but the number refers to the route, not, um, the route.